What an amazingly positive day this is proving for Tibet’s cause, across the internet and social media people are discussing and sharing about Tibetan independence, over on Twitter the flag of Tibet is being shared far and wide. Wonderful to see such solidarity and good-hearted actions. Special mention must be made to those Anonymous activists who have again shown a remarkable capacity to break through China’s internet defenses and wreak havoc with Chinese government websites. 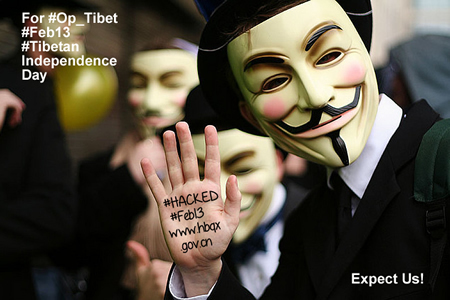 There has been much buzz over on Twitter over the past week and it was great to see that ‘Operation Tibet’ was going to strike on Tibetan Independence Day in support of Tibet’s just cause. 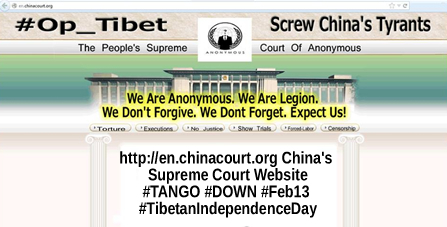 Imagine the applause then which erupted over the past few hours as Anonymous targeted a number of websites run by China’s regime, some operating in occupied Tibet, and left a trail of wreckage, defacement and hacked sites, including that of the Supreme Court of China, which was taken offline by hacktivists earlier this morning. Others have been trashed, including a site linked to East Turkestan, the content of which has been removed and replaced with unreadable characters. While two sites that cover regions in Eastern Tibet have been completely crashed! It’s a remarkable action and this Blog wishes to express a genuine gratitude to those anonymous individuals who have invested their skill, experience and energy in striking a blow for Tibet at the virtual heart of China’s tyrants. 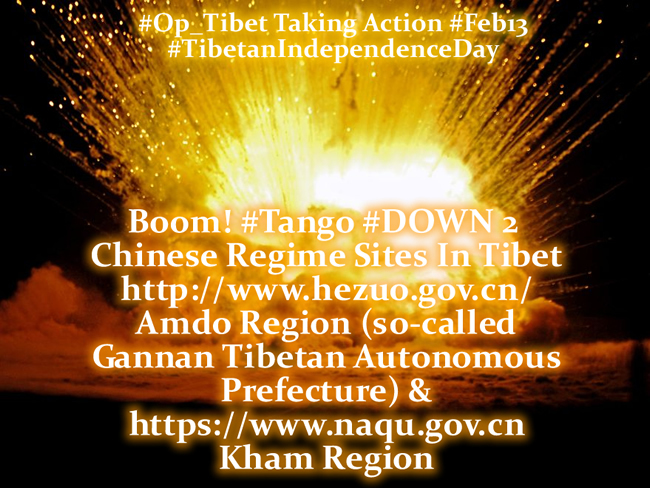 Thanks are due also to our many friends on Twitter and also @tibettruth for sharing information on this latest action, as we have said previously, together we make the difference! Awesome work guys and the oppressed people of Tibet would be very happy and encouraged to learn of such incredible support.